Erected in 1880 as a lodge hall, this well preserved historic building served as the town's community center until 1930. Dances, plays, commencements and roller skating took place in the large hall. 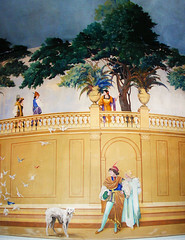 The 2nd floor meeting room houses historic exhibits and features wall-to-wall frescoes by local artist Charles L. Newcomb, painted in 1913. The third floor was the lodge meeting room. 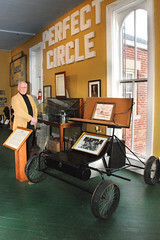 The museum pays tribute to early automotive history, including Perfect Circle and the Teetor-Hartley Motor Company. The ground floor serves an art gallery and teaching center, with many original works being offered for sale. 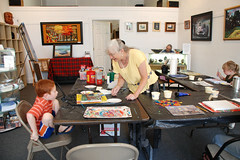 Area artists are invited to inquire about displaying their work. Contact the museum for information on current fine arts classes being offered. 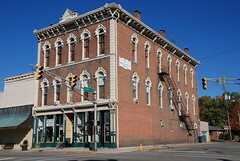 Follow the Hagerstown Museum & Arts Place on Facebook. View more pictures from the Museum.